Happy New Year! I hope everyone had a great holiday season and are enjoying the New Year! Wow, 2019 is here. 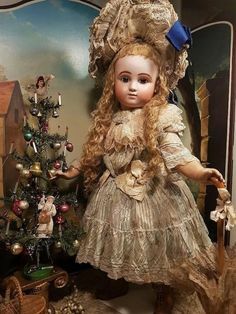 I am looking forward to a brand new year and many dolls are in the works for this year along with new online classes and other things. I just finished putting together these two Bleuettes and a “Friend”! Tonight I am offering them as undressed dolls. I am hoping by Monday to get them dressed and then they will be available dressed or undressed. Undressed they are $325.00 each, dressed they will be $375.00. The first one is made from the Seeley “Premiere Jumeau” mold. 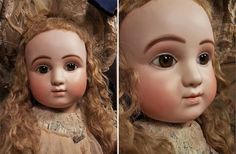 She has blue paperweight glass eyes, a pale blonde mohair wig and hand carved teeth. I just love this 1907 Jumeau Bleuette “Friend”. 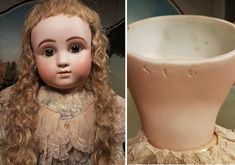 She is made from a Jean Nordquist Collectible Doll Company Mold. 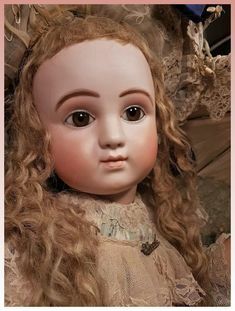 She has brown glass paperweight eyes and a blonde mohair wig with hand carved teeth. This is the Premiere Jumeau Bleuette made from the Jean Nordquist Collectible Doll Co. mold. She has brown glass paperweight eyes, a mohair wig, and hand carved teeth. All dolls are available undressed for $325.00 plus shipping. Please contact me at 815-565-0024 or email me at landofozdolls@mchsi.com if you are interested in purchasing. Layaways are available. Thanks for stopping by Land of Oz Dolls and see you real soon! Have a great dolly day! 8th Day of Christmas Sales! This is What’s on Sale! It’s the 8th Day of Christmas and this is what’s on sale! I have one only 9 1/2″ Bambino “Bleuette’s Baby Brother” as my featured selection of the day. Isn’t he just adorable?? Bambino comes complete with his little pants, shirt, and hat. 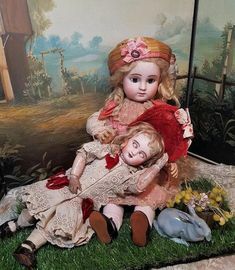 The authentic reproduction costume was sold for many years through Global Dolls. Bambino has painted hair, brown glass eyes, and a paper mache baby body. Bambino stretches out to about 9 1/2″ long. Bambino (“Bleuette’s Baby Brother”) was made from a Collectible Doll Company Mold. Bambino has a cut out mouth with a porcelain molded tongue inserted. Bambino’s regular price is $395.00 but is on sale through December 20th, 2018 for $350.00 plus shipping. I only have one so if you are interested in purchasing or have any questions please contact me at landofozdolls@mchsi.com or phone 815-565-0024. If you are a Bleuette or Rosette collector he will be a great addition to your family. 7th Day of Christmas! This is What’s on Sale! Today’s featured item is my “In-Depth Modern Doll Blue and Brown Eye China Paint Kit by Land of Oz Dolls! The kit includes eleven colors of dry china paints, all the colors needed to paint both blue and brown eyes. Included is the paints to completely finish painting a modern doll. China Paint Colors in the Kit: Darkest Blue, Blue-Grey, Pale Blue, Aqua Green, German Dark Brow, Innocent Pink, French Lip, Rose Sugar, Pupil Black, German Dark Hair, and Dark Coffee Bean. Regular Price is $74.00 on sale through December 20th for $65.00. To order please email me at landofozdolls@mchsi.com or phone 815-565-0024. Don’t forget the “April” Eye Painting CD Workbook is currently on sale for $35.00 through December 20th. I also have a Modern Doll Eye painting Brush Kit available. Painting these beautiful eyes is a challenge but oh so rewarding. I love watching them come together over multiple firings. It’s the 5th day of Christmas and this is what’s on sale! For all of you Bleuette “lovers” out there! I am very pleased to announce that the 38mm, #733 Girl’s Dress Shoes for Bleuette are today’s Christmas Special. These darling vinyl, strap shoes with side buckles, come in your choice of eight colors. The 38mm size fits the wooden Bleuette body. Colors available are white, black, light pink, light blue, purple, red, yellow, and light green, Cost is regularly $7.00 per pair, but the special sale price is $5.00 per pair. No limits to how many you can order while stock is available. I have always had many requests for these beautiful little vinyl shoes and they have been out of stock for quite awhile, so now is the time to restock some of these great colors you have been waiting for. These shoes are on Christmas special from now until December 20th. Please email or phone in your order. The website will not give you the sale price. Email is landofozdolls@mchsi.com or phone 815-565-0024.